OSU's Fidler is called for hooking with 11:48 left. UW on its fourth power play (1-for-3). 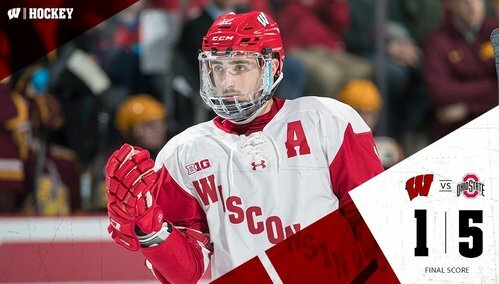 Badgers come up empty on the man-advantage. Halfway through the third. 9:40 left in the third. OSU leads UW 5-1. Badgers are outshooting the Buckeyes 7-3 in the third. Johan Blomquist now in between the pipes for the Badgers. I missed this, but Johan Blomquist is now in net for UW. So all three goalies have appeared tonight for the Badgers. First home appearance for Blomquist, a freshman who played 1:09 at Denver. Another UW man-advantage coming up with 7:36 left in regulation. OSU kills off the Badgers' power play. Malone now heads to the box with 5:25 left in regulation. Malone actually gets five for spearing and a game disqualification. OSU 5, UW 1, 5:25 left/3rd. UW player gets a major and DQ for spearing. Buckeye power play. UW's Seamus Malone just got tossed for spearing, with a DQ. So he's out for tomorrow night's regular-season finale. 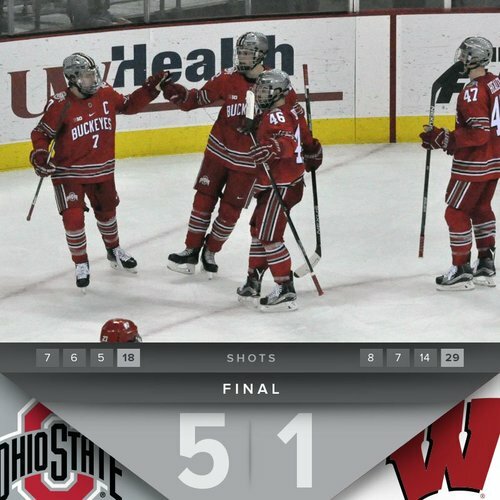 FINAL: Ohio State beats Wisconsin 5-1, handing UW's hopes for an at-large bid a major blow. Gophers win the B1G outright. UW will be 2 seed. FINAL: No. 15 Ohio State 5, No. 16 Wisconsin 1. GAME TWO: 8pm ET Saturday in Madison on BTN. Northwestern is up 56-51 over Maryland with 6:18 to play. The winner goes on to play Wisconsin tomorrow afternoon. Northwestern's Scottie Lindsey has 16 points with just over 2 minutes left. He didn't play when Wisconsin fell to NU on Feb. 12. Northwestern is up 13 points with 1:49 to play. Looks like UW is going to get a rematch with the Wildcats tomorrow afternoon. Northwestern beats Maryland 72-64. Wisconsin will play the Wildcats tomorrow afternoon at 2:30 p.m CST. Granato said he believes Jurusik will be out for a while. Granato also said he thinks his team will play its best game all year tomorrow. Kunin said that physicality, chippiness was a result of two teams who are hungry to win. Tony Granato said he thinks Badgers G Matt Jurusik will be out for a while. "I don't know the severity of it, but it sure didn't look good." UW's Jack Berry on his night: "You've got to be better out there. Making 10 saves on 15 shots isn't going to get the job done." Ohio State national-best 12-2-3 on the road. Steve Rohlik: "They love the competition. It's just kind of a mindset that we have right now." #Badgers hope for at-large NCAA bid likely on the line Saturday. Tony Granato: "I think our team's going to play its best game of the year." The Badgers were able to clinch a bye in the Big Ten tournament next weekend. Big night tomorrow for Senior Night.